Does your back hurt? Do your legs ache? Have you been searching “Natural remedy back pain” or “Natural remedies for leg pain”? Try TheraLife Back & Leg. This high potency formula can help alleviate aching. Soreness in the lower back muscles may be caused by spending time in a stationary position, improper lifting, athletic activity, or injuries. 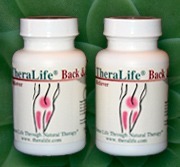 TheraLife Back & Leg contains herbal extracts that may help decrease inflammation, improve blood flow, and support the immune system.